For the past couple of months I've been working on a show called Lionboy with Complicité and we're coming to the end of our run at the Tricycle Theatre. The show had a live percussionist on stage, so this week I've decided to record Steve's (our percussionists) Gil. 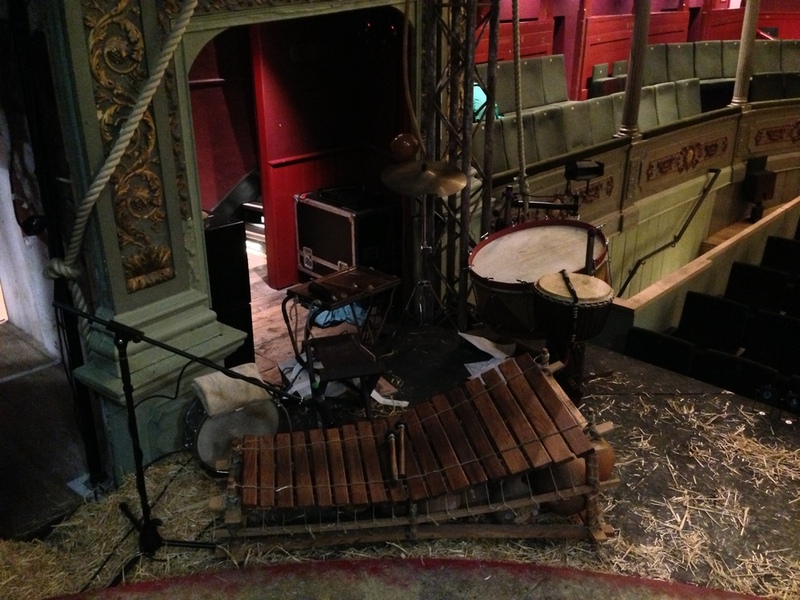 The Gil is an African 'tuned' percussion instrument that steve plays in the show for a few of our 'African' scenes. It's not the most common instrument I've ever come across! The notes are pentatonic and so, as Steve usually suggests, you can play almost any notes and they will likely fit together! Steves instrument was made by his teacher in Africa and has gaudes underneath that amplify the sound. It has a bit of a weird unique buzzing sound on some of the notes and watching people play them on YouTube it's really meant to be part of the overall sound of the Gil. To create the buzzing sound there is a spider egg membrane covering holes in the gaudes which vibrate, strange but true! So having decided to record the Gil properly Ive also thought it would be interesting to learn how to make a kontakt instrument using those recordings, so have taken a bunch of different takes at differing dynamics and will have a go soon. I managed to find a few hours without anyone else in the theatre and got recording. Wanted to get some use out of my sound devices 702 and a pretty neat pair of DPA 4011's which we use in the show. Here's a dry clip of me messing around on the Gil, i'm no percusionist so forgive me! Now on to editing the single hits and trying to make a virtual instrument from it!